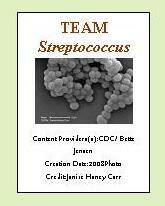 Streptococcus: Probiotics AND Bad Bacteria?????????? Streptococcus are not just bad bacteria that cause disease, but they are also probiotic bacteria for disease prevention. Some of these bacteria are probiotics, some are more-or-less neutral but will take advantage of an opportunity to cause infection, and some of them can be called “bad bacteria” that can make us seriously sick if we are at all compromised. What Kind of Bacteria Are They? Streptococcus is the name of a genus of Gram-positive, non-sporulating, spherical-shaped, chain-forming, lactic-acid bacteria. They are facultative or obligate anaerobes. They ferment glucose to lactic acid. More info about genus and classification of microbes can be found here. Streptococci (plural) are found in many environments in nature. In people, they normally live on your skin and on your mucous membranes inside your body, but they can translocate to inner tissues. This site doesn’t focus on pathogenic microbes, so only brief descriptions of a few “bad” Streptococcus species will be mentioned. The point of even discussing them is so that you will be able to appreciate how subtle genetic differences between microbes can determine if one is a probiotic and one is a pathogen (disease-causing organism). Also, you can appreciate how important prevention of disease is, and see that probiotics play a role in that prevention. Once an infection is established, it is harder to fight and needs to be evaluated by a qualified physician. Prevention really is the ticket to a healthy lifestyle and saving money. Why Do Some of Them Cause Disease? Some species of Streptococcus, such as S. pyogenes and S. pneumoniae, can be particularly pathogenic because of the toxins they produce, they way they can attach to our cells, and/or the way their cell walls, including their outer capsules, are constructed. They require close, personal contact for them to transmit from one person to another in infected mucus or wounds. (Remember I said that they are anaerobes? They can't survive out in the open.) Washing your hands frequently, covering your mouth when you cough, disposing of used tissues, not sharing drinks, not kissing on the mouth, etc. are ways to stop the spread of these bacteria. Let me mention washing your hands, again. It’s one of the biggest ways to limit infection to others as well as to protect yourself from getting sick. Plain ‘ol soap and water work well. Just scrub and rinse. S. pyogenes is the villain that causes the dreaded strep throat. It grows best with a source of blood. It usually causes disease in the respiratory tract, the bloodstream or in and on the skin. It can also cause scarlet fever, rheumatic fever, meningitis, pneumonia, sinusitis, ear infections, joint and bone infections, toxic shock-like syndrome and infections of the topmost layers of the skin (impetigo) or of the deeper layers of the skin (cellulitis), among others. It is a member of the Group A strept bacteria. However, it is estimated that between 5-15% of healthy people have the bacterium, usually in their respiratory tracts, yet do not have disease symptoms. Their immune systems are able to keep the villains under control. (Hmm…isn’t that one of the things probiotics help with?) Most S. pyogenes infections follow a viral infection or a disruption in the normal flora. S. pneumoniae is the bad bacteria that causes pneumonia, sinusitis, ear infections, meningitis, and more severe, invasive infections affecting the joints, bones, heart, abdominal cavity, skin and brain. It is not normally a permanent resident of a person’s normal flora. It has major antibiotic resistance advantages compared to other bacteria in that it can exchange genes with some other bacteria. It can also mutate and adapt to conditions. According to Todar, in a medium containing blood, the bacterium can double in number within 20-30 minutes. The fast growth rate is one reason why it is so virulent (rapid, severe and destructive). It also has some self-destruct mechanisms that not only destroys itself, but causes inflammation and damage to the human tissues around it. Which Streptococcus Bacteria Are Probiotics? The Streptococcus species of bacteria used as probiotics are S. thermophilus and S. salvarius. Each of these species is examined on other pages. Go to Bifidobacterium, Lactobacillus or Saccharomyces pages.